Saudi Demand On BlackBerry Could Affect Dissidents BlackBerry users in Saudi Arabia can apparently rest assured that their messaging service will continue. But they cannot be certain their communications will remain entirely private. Dissidents and human-rights activists worry the compromise would mean their private communications could be monitored by security agencies. A Saudi customer is served in a mobile shop at a market in the capital Riyadh on Thursday. BlackBerry users in Saudi Arabia can apparently rest assured that their messaging service will continue. They cannot be certain their communications will remain entirely private, however. Saudi authorities had threatened to block the BlackBerry Messenger service unless the device's manufacturer, Research in Motion, made its encrypted communications more accessible to government security agencies. Saudi officials won't say what specifically changed their mind, but they hint that a compromise has been reached. In a statement released Tuesday, the government's Communications and Information Technology Commission cited "positive development in the completion of part of the regulatory requirements" as justifying the continuation of the BlackBerry messaging service. Still, the BlackBerry controversy is likely to continue. The governments now objecting to BlackBerry usage -- the United Arab Emirates, India, Tunisia and others, in addition to Saudi Arabia -- say their concern is security. By encrypting electronic communication, these governments say, a BlackBerry makes it possible for criminals or terrorists to conspire without the knowledge of the authorities. What's So Worrisome About A BlackBerry? "Individuals who use their BlackBerrys for secure communications are doing it because they are transmitting sensitive information, whether it's business information or political information or free speech information, that they don't want to be accessible to anyone other than the sender [and the recipient]," says John Verdi, senior counsel at the Electronic Privacy Information Center. RIM has never said how exactly it encrypts communications to make them secure, and it won't say how it has now met the Saudi demands for more access to those communications. RIM officials briefed State Department officials Monday on their discussions with Saudi authorities, but State Department spokesman P.J. Crowley provided little information about any deal that was reached. "Their perspective was that they believe that there are, broadly speaking, solutions available that, on a country-by-country-by-country basis, can satisfactorily address and balance the regulatory, security and access issues that are at stake," Crowley said at a news briefing Tuesday. BlackBerry messages are passed through servers in Canada, where RIM is based, and in Britain but not elsewhere. 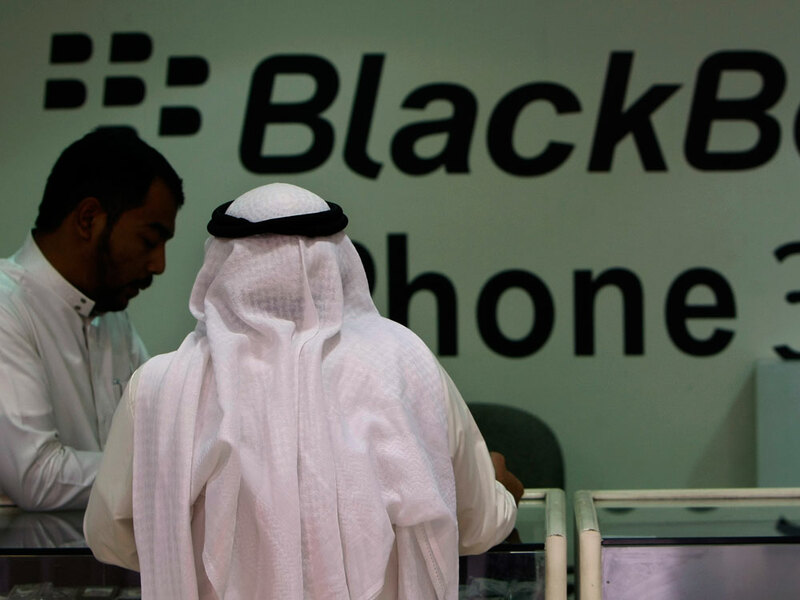 According to some reports, RIM has now agreed to establish BlackBerry servers in Saudi Arabia. Verdi says such a move could be critical, because even encrypted messages at some point in their transmission are generally translated into plain text, if only briefly. "It's unclear whether these messages are going to be translated into plain text in Saudi Arabia or whether that's going to happen somewhere else," Verdi says, "but locating the servers there at least raises the possibility that these messages will become much more accessible to governments." One concern is that other Middle Eastern countries may now demand concessions similar to what RIM has apparently made to Saudi Arabia. That could be a factor in RIM's determination not to reveal its agreement with Saudi authorities. Matt Thornton, a telecom analyst at Avian Securities, says RIM would probably want separate deals with different governments. "I don't think it's plain vanilla," Thornton says. "I think it's going to be much more on a case-by-case basis. That's why this is very sensitive. I don't think the details will ever fully reach the light of day." For dissidents and human-rights activists in the Middle East, the worry is that the BlackBerry compromise, if repeated in other countries, would mean their private communications could be monitored by government security agencies. "Internet users around the world aren't just using it to chat," says Robert Guerra, director of the Internet Freedom program at Freedom House. "They're using it to organize and express themselves, and BlackBerry is positioning itself as a device where it might not be safe to communicate. "That sets a dangerous precedent." In fact, democracy activists in the United Arab Emirates say they used their BlackBerrys to organize recent demonstrations there. They fear that is what prompted UAE authorities to propose a ban on BlackBerry communications beginning next month. Whether that threat remains at this point is unclear. Guerra and other democracy advocates criticize RIM for what they see as submission to government pressure. Guerra contrasts the RIM position to that of Google, which threatened to leave China rather than continue submitting to government censorship. "Google kind of stood up," Guerra says, "and said, 'We're willing to lose the [Chinese] market because we think freedom of expression and the great power of Internet freedom is something that could be useful.' RIM in this case has taken the wrong road and said, 'We're willing to comply, just to have the business.' "
Not everyone agrees the stakes in the BlackBerry dispute are so high, however. "What you've seen is more noise than anything else," Thornton says. "I think this is a function of different countries looking for ways to work closely with RIM such that if there are security concerns, they have a feasible way of contacting and working with RIM to solve the issue." The threat of BlackBerry suspensions -- in the United Arab Emirates, Saudi Arabia, Tunisia and elsewhere -- may have been little more than a "hardball" tactic to get RIM to the negotiating table, Thornton says. "I don't think the governments have any vested interest in shutting down the BlackBerry service," Thornton says. "I think this was more of a negotiating ploy." The government demands clearly presented RIM with a marketing dilemma. If the company is forced by governments to compromise its encryption technology in order to hold on to its 1.5 million BlackBerry users in the Middle East, customers elsewhere could be chased away. It is, after all, the promise of privacy that attracts many BlackBerry users in the first place. In a statement issued last week and recycled in response to the Saudi announcement Tuesday, RIM said BlackBerry users "can maintain confidence in the integrity of the security architecture without fear of compromise."